In a room set off this conference’s sprawling exhibit hall, where ed-tech companies from across the world boast of all they can do, Britain’s education secretary reminded them of where they’re still falling short. 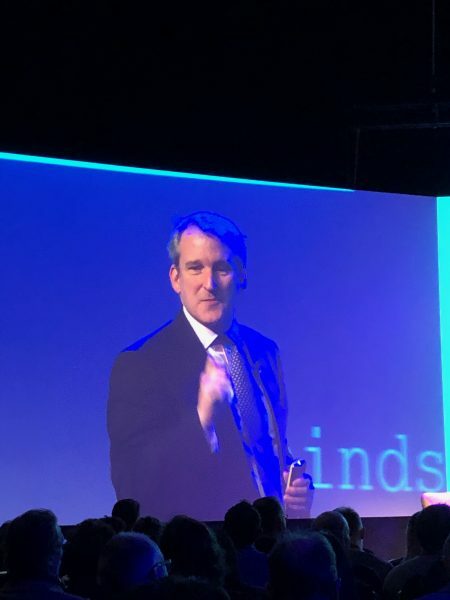 Damian Hinds, the U.K.’s secretary of state for education, opened the massive Bett summit–now in its 35th year–by praising tech innovations pushed along by schools and private-sector vendors. “Ed tech sometimes gets a bit of a bad name because this is one of the few sectors where technology has been associated, for some people, not with a decrease in work, but an increase,” the secretary told the audience, speaking in an enclosed auditorium adjoining the Bett showroom. Looming over the ed-tech conference–and the entire British economy–is the tumult surrounding Brexit, the country’s still-uncertain path to leaving the European Union. The British public approved the EU exit by referendum in 2016. But Prime Minister Theresa May’s plan for withdrawing from the EU was resoundingly rejected by Parliament this month. That has left her party scrambling to come up with an alternative by a March 29 deadline. The outcome will have implications for many sectors of the U.K. economy, potentially including ed-tech providers. Caroline Wright, the director general of the British Educational Suppliers Association, acknowledged the uncertainty surrounding Brexit, but said the U.K. ed-tech sector is “incredibly vibrant.” Britain’s ed-tech industry is made up of about 850 companies “punching above their weight” in the market, in Britain and internationally, said Wright, speaking after Hinds. British ed-tech innovation will likely hinge on the government working closely with the private sector, regardless of what happens with Brexit, Wright said. The projected export value of U.K. ed tech today stands at £170 million, Hinds said in his address. One of the chief values of ed tech, the secretary said, comes in its ability to reduce administrative busywork for school administrators and teachers. Yet educators often don’t believe digital tools meet that mark. As an example, Hinds pointed to the steady increase in the amount of data and algorithm-based information tech can produce for schools. In too many schools, the “sheer amount of data that has to be inputted into these systems can create an additional burden on teachers,” he said. Hinds also acknowledged the vexing challenges vendors face in trying to penetrate the British market, barriers not unlike those that trip up companies trying to sell in U.S. schools. Like the U.S. market, the British education school system is enormously decentralized. That decentralization is a strength, argued Hinds, but it makes it tough for companies to figure out how to market their products to so many buyers. The process can be equally frustrating for school officials, he said. They’re trying to choose among many unfamiliar ed-tech brands that British educators aren’t sure will even be around a few years from now. British school administrators are also sometimes wary of signing a long-term contract with an ed-tech provider, the secretary added. For school officials, “it can feel like you’re locked in,” Hinds said. As a result, British schools may stick with a product longer than they might want to–or they might be reluctant to take on a new product to begin with. Hinds has previously urged greater cooperation between the government and private sector to improve the quality of ed tech. Last year, he called on industry to help “launch a revolution” in the quality of ed tech in Britain, in areas like improving teacher practices and training, helping individuals who aren’t in formal education systems, and improving efficiency. At Bett, Hinds touted project in the works by the government and private sector that he said have the potential to bring new ideas into the market. He said the British government is setting aside a £10 million “innovation fund” focused on assessment, improving teacher practice, parent engagement, and other areas. Additionally, both he and Wright said they were optimistic about LendED, a new online marketplace designed to help schools find ed-tech products that work for them. The site, developed by BESA and sponsored by the Department of Education, is a searchable portal on products for educators that includes case studies, testimonials, and reviews of them turned in by other school users. Educators can request free trials of ed tech tools, and post reviews of their own. All companies featured on the site are members of BESA, which puts them through “financial and reputational checks,” according to the website. Photo of Damian Hinds on Jan. 23 at the Bett conference by Sean Cavanagh. Games make us disciplined, in thinking and in actions. And discipline among the members of the society is of http://coolmathgamesjunction.net the greatest value. Our animal instincts are brought under control.